His mother, Sharran Sutherland, shared intimate photos of her “perfect” little boy in a Facebook post on October 12, which would have been his due date, hoping to show the humanity of the baby in the womb. The post went viral, attracting more than 36,000 likes, shares and comments. Since her story was picked up by the Mirror, she says she has many people have been reaching out to her on messenger – including women saying they have been inspired to keep their babies. Mrs. Sutherland, a mother of 11 from Fair Grove, Missouri, wanted to prove that Miran was “a real” baby, after the doctor called him “medical waste”. She also wanted to share what unborn babies actually look like. “I just couldn’t believe how perfect everything was on him.” Mrs. Sutherland said. “His ears, his tongue, his gums, his lips. I couldn’t believe it. She also said that society’s contradictory attitudes towards the unborn make it more difficult for women who lose babies to miscarriage. “This world has done a great job at dehumanizing unborn babies. The abortion industry has done a great job at that but it doesn’t just affect women who are getting abortions. “It affects women who have lost their babies too – because the world doesn’t view their children as babies,” she said. “So when a woman loses her unborn child she’s not able to grieve in the same way as a woman who gave birth to a baby that dies after being born. When a woman loses her unborn baby it’s almost like you don’t speak of it. A woman goes through it alone and I believe that’s because other people don’t recognize it as a human, as a baby. Mrs. Sutherland also shared that she has been contacted by many women suffering after an abortion , including those who were coerced into it. Despite her heartbreak, Mrs. Sutherland knows that Miran’s life had purpose and meaning, and has helped others. 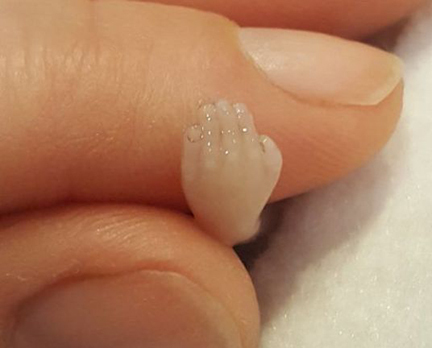 “I couldn’t believe that he had touched somebody,” she said when her friend chose life for her baby after seeing the photos.